The Queen of Hearts by Kimmery Martin got a lot of social media buzz this winter, especially with such a gorgeous, Instagram-worthy cover. 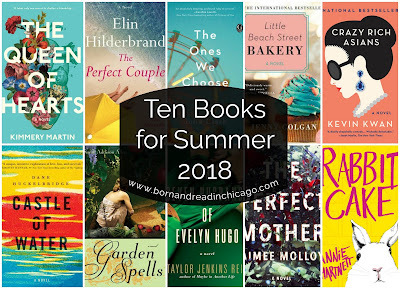 Apparently the inside is worthy of the outside, as some of my most trusted sources gave this novel the thumbs up (Megan's review, Tara's review and Anne Bogel's Summer Reading Guide). A Grey's Anatomy-esque drama sounds perfect for summer. It wouldn't be summer without a trip to Nantucket! I didn't go for Hilderbrand's new book last summer, as I was catching up on some backlist that helped prep me for the final Winter Street book. This summer's The Perfect Couple is her first Kirkus starred review (after 21 books!) so I am definitely adding it to the beach bag. The Ones We Choose by Julie Clark is my pick for a debut author read. This story about the emotional bonds versus the DNA that bonds family sounds intriguing and hopefully a family drama with a little heft. I have yet to read a Jenny Colgan novel, but from what I gather, they are perfectly cozy and sweet reads. I'm hoping Little Beach Street Bakery will be the perfect summer treat that the title evokes. Crazy Rich Asians by Kevin Kwan is hitting the big screen this summer and looks like so much fun! I don't know how I missed the boat on this one years ago, but I hope to make up for it in time to watch the movie. I think Rabbit Cake is a great summer read! Easy to get engrossed in and doesn't take too much concentration! You are going to love Crazy Rich Asians! The entire trilogy is fantastic. I saw him at a book event in Seattle and he said everything in the books is true- which once you start reading you will not believe. They are so much fun! I've either read or want to read more than half of these! Great list! I love summer reading!